Meet Sons of Anarchy creator KURT SUTTER in his first signing at a comic book store! We scheduled this event to coincide with LUCAS STAND #1, but had to postpone, but here we have it! 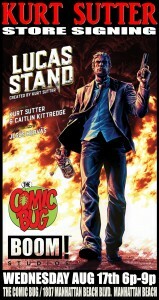 Wednesday, August 17, just in time for the release of LUCAS STAND #3! Lucas Stand is a military vet who can’t reintegrate into society and has emotionally cut himself off from the people he loves. At his lowest, Lucas does something he can’t take back. Hell comes calling, offering him the opportunity to make things right. Demons escaping Hell are upsetting the balance of evil, and now Lucifer has recruited Lucas to send them back. It doesn’t matter in what era the demons escape—World War II, old-timey Hollywood, Vietnam, present day—he must learn to fit in both the past and the present. Given new purpose, Lucas starts to rebuild himself and his life, even as he struggles at the human cost that comes with it. Buy the book! Meet the man! 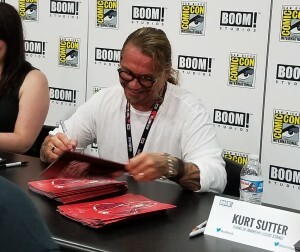 Get the book signed!